Home Blog The force has awoken! Are you our winner? The force has awoken! Are you our winner? If you’ve been keeping up with our Facebook page you wouldn’t have been able to miss our Site Wars: The Foreman Awakens competition. When it comes to a Star Wars giveaway, we just couldn’t resist. To celebrate the launch of the new Star Wars movie we’re giving away a brand new Xbox One with Star Wars Battlefront and two tickets to see the film! Hundreds of you entered but there could only be one (Han) Solo winner. So, in true Oscars fashion, we’ve opened the golden envelope to reveal that the winner is….. Damian Lister! 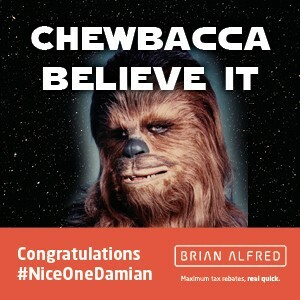 Chewbacca believe it Damian, you’re our winner! We’ll be in touch with you shortly to sort out the details. Thank you to everyone who entered the prize draw and if you haven’t won this time be sure to keep a close eye on our Facebook page as there’ll be plenty more competitions, giveaways and exciting news coming soon! From everyone here at Brian Alfred, we wish you a merry Christmas and a happy New Year! Star Wars giveaway. Nice one Brian!